With all of the grain-less bread options out there you have many healthy options these days. Oil a 3 quart baking pan with a brush. Place break on a cookie sheet in an even layer. Dry in a 250 degree oven for about an hour (flipping about every 15 minutes) or place on sheet a day earlier, defrost and dry on the counter, uncovered. If it is not dry enough, put in oven for about 15 minutes or until it feels like dry toast. Place 1 cup raisins and 1 cup broth in saucepan and bring to a boil. Boil for 5 minutes and remove from heat. You can also microwave for four minutes. Set aside to cool. In a heavy skillet, heat 2 tablespoons of the EVOO. Sauté onion and fennel until soft, about 10 minutes then cool slightly. Cube the dried bread roughly and place in a very large bowl. Add salt, poultry seasoning, cooled raisins, onion and fennel; whisk eggs and add to the bowl, tossing lightly with your hands. Place the mixture in the prepared baking pan. Drizzle with a little more EVOO and another cup of broth. Bake, covered for about 35 minutes at 350 degrees (with other things in your oven) and uncover for the last 10 minutes. Here is my take on this recipe. You won’t miss the sugar and fat! Brush D’Avolio EVOO into a 1 1/2-quart casserole. It also works well in a pie plate. Heat oven to 350°. If you double the recipe, bake longer and check with a knife.In a large mixing bowl, combine all ingredients and whisk or beat on low speed until blended. Pour into the prepared casserole and bake for 55 to 65 minutes, or until a knife inserted in the center comes out clean. If desired, serve with sweetened whipped cream and cinnamon sugar for sprinkling.Serve with whipped cream. My son was home for the weekend and along with a Sabres game with his dad we gathered family and friends for a dish of macaroni. Sunday dinner is the extra effort meal. Sunday dinner does not need to be sauce and macaroni but in the middle of the winter it was a natural choice. I think that any dish that takes a few more minutes and you would not have the time nor the effort left in the tank after a long work day to prepare is a worthy Sunday dinner meal. 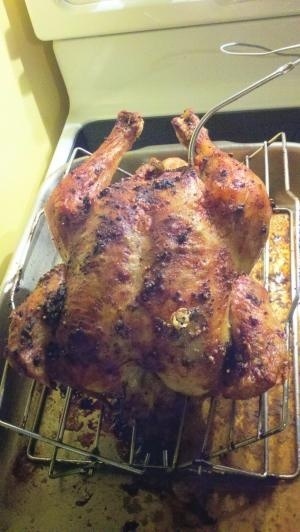 My mother often used to make a rib roast or roasted chickens on the oven rotisserie. Sunday dinner smells good. I love how the house smells during these cooking sessions and sometimes for days after. If you make something with bacon it’s a gift that keeps on giving for days to come. Sunday dinner is not complete without dessert. I talk a lot about how my mom used to bake every Saturday and how I remember watching her bake pies. I have some sort of a pastry deficit but still give it a try when peaches are in season. Let’s talk some more about Sunday dinner. Please feel free click the email link below and give me your story. What do you cook? Who is at the table? When the meal is special and you’re surrounded family and friends, any day is Sunday. I know folks who work in different service industries who have Monday evening Sunday dinner. Yesterday I invited my family and as is usual custom in our home there were a few friends I had never met before they came to my home. Please take the quiz and most especially please share the quiz with your friends. It’s easy to share. Click the “Share This” button below the quiz or click the “Share” button below this post and post on your Facebook wall and Tweet it with your friends. Please encourage them to share it as well. If you do other forms of Social Media send it out…the more the merrier! Message me on Facebook if you would like to share your stores about Sunday Dinner. My goal is to get 200 responses by Wednesday June 27, 2012. When I was a kid, Sunday was a day of rest … for everyone but mothers. Sunday was a ritual, almost religious in its well-kept traditions. In our family my mother made dinner every Sunday. 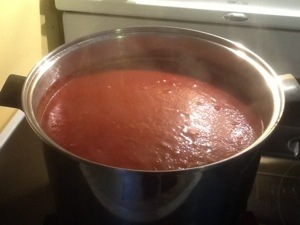 Some weekends, it was the predictable tomato sauce but more often it was a rib roast or roasted chickens. My mother had a rotisserie in the oven and I can still hear the mechanical sound as dinner rotated evenly around and around until cooked to perfection. Dinner always included a “nice” salad (I guess other families had to deal with the nasty ones because ours were always nice) and dessert. Dessert was special because it was saved for weekends. On Sunday, we would get to eat the pie with homemade crust painstakingly created on Saturday afternoon or a cake baked with mom’s secret flavor combinations. My dad was an only child so my Gramma Russo was always with us. We didn’t have to share her with other cousins like we had to share Gramma Massaro. So the deal was, we would all eat at our own house then, wherever Gramma Massaro ate dinner was the location of “coffee.” Aunts and uncles and cousins would start to arrive after dishes and the leaves were inserted into the table. The coffee pot went non-stop and all of the confections consumed. Ed Sullivan would be on TV as long as there was no game on. I really do remember seeing that long-haired band called the Beatles on one night and hearing my uncles laugh about all of the girls screaming. When we were first married, we continued to go to our parents’ houses, alternating to make it fair. I must admit, though, it was a bigger deal in my family so we were there most weekends. As time went in I longed to have a Sunday alone or with people I did not have a direct DNA match. Foolish, silly me, because eventually Sunday dinner became an infrequent occurrence celebrated like an occasional high holy day. When I became a mother and our mothers moved from our long time family homes to small efficient condominiums, I tried to continue the Sunday dinner tradition even if it was only once a month. All were welcome but it usually ended up to be our mothers and various aunts and uncles. I still try to have Sunday dinner whenever we are in town, even if it is just my husband and me. Sunday, I made a roast chicken (no rotisserie for me) which I rubbed with a concoction of D’Avolio California Arbequina EVOO, chopped garlic, parsley, paprika, mustard seeds, dried mustard, coarse salt and fresh ground pepper. I lifted the skin and put some under it on top of the meat. I rubbed some inside and put the rest on the skin on top. I preheated the oven to 450F, inserted the thermometer probe (this is one of the most important tools in my kitchen) and put the chicken in the oven. I immediately reduced the temperature to 350F and cooked it until the internal temperature reached 165F. 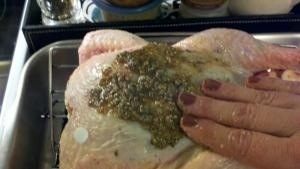 I covered it with foil for the juices to set and made mashed potatoes, peas and pan gravy. Just because it was only the two of us doesn’t mean we cannot enjoy a special Sunday dinner. You can see the results above! I am writing a book called “If It’s Sunday Dinner We Must Be Family” and want to know how you celebrate Sunday. Here is a challenge to my foodie friends (face it, you read this if you are a foodie and/or my friend! ): Please share your Sunday story. I would love to know things like how you prepare, who attends (not names rather relationships like children, in-laws, neighbors, etc.) and menu. If the menu changes, who decides? Are they special occasions only? Tell me anything to help me understand how you value the tradition of Sunday dinner. Each month I will post my favorite one. Each month D’Avolio will reward the winner a $25 gift card good at any of their locations.